The genus name is from the Greek words elein which means ‘to injure’ and bora which means ‘food’—the name itself bears a warning about the toxicity of this plant. Species name describes the black roots of the plant. Commonly known as Christmas rose and Lenten rose to fit the Christian calendar, these early spring blooms are not roses at all, but members of the buttercup family. Native to Eastern Europe and Asia, Hellebores have a long history in the treatment of various ailments—gout, paralysis, cardiovascular disease, mental illness, and also as an abortifacient, dieuretic, purgative and narcotic. The ancients were fully aware, however, of the toxic and lethal effects of the plant as indicated by the numerous tales and legends that have come down to us. As early as 595-585 BCE, H. niger was used to poison the water supply of the citizens of Kirrha, allowing their besiegers an easy victory. According to some, Alexander the Great is said to have died of an overdose of a helleborus potion. Christian lore mentions a young shepherdess, Madelon, whose tears when she is unable to find a gift for the new-born Christ, give rise to the Christmas rose. In Arthurian legend, Guinevere’s infertility is attributed to extract of Helleborus root, concocted by the sorceress Morgan-le-Fay. Witches were thought to summon demons or turn invisible by the use of this plant. 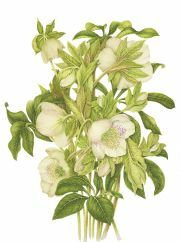 Hellebores favor shady, cool, climes and have been hybridized to produce quite dramatic, spotted and speckled varieties to appeal to gardeners. They range in color from white to pale pink, burgundy and dark, deep near black (hence H.niger) You can see them battling and braving their way through the previous year’s foliage, through the snow to reach for air and light and announce the arrival of a new season, a harbinger of spring.